Medina House is all that remains of the Medina Baths, a sprawling pool complex which occupied an enviable spot on the Hove seafront. The Medina Baths were built to the designs of P. B. Chambers by the Hove Bath & Laundry Company in 1893-4 and graced two adjacent plots on King’s Esplanade, one either side of Sussex Road. The much larger plot to the west was dominated by laundry rooms and a 93 ft pool for men. The plot to the east contained a pretty building with a Dutch gable called Medina House which incorporated the 65 ft women’s pool. The pools were filled with salt water from the nearby sea. By the 1930s, the Medina Baths were no longer fit for purpose and a replacement was built nearby in 1939. The new baths were called Hove Marina until they were requisitioned by the Admiralty upon the outbreak of war, at which point they became HMS King Alfred. Accordingly, the Medina Baths continued to be used into the 1940s. The western section was demolished in 1976 and Bath Court now stands in its place. The eastern section survived though and Medina House was home to Monnickendam Diamonds from the 1940s until 1994. In a quite disgraceful manner, the women’s pool area was ripped apart in 2000 leaving an intricate faïence tile scheme exposed to the elements. Various outbursts calling for towers on the site over the years have come to nothing including a planning application for a ten storey tower being turned down in December last year. 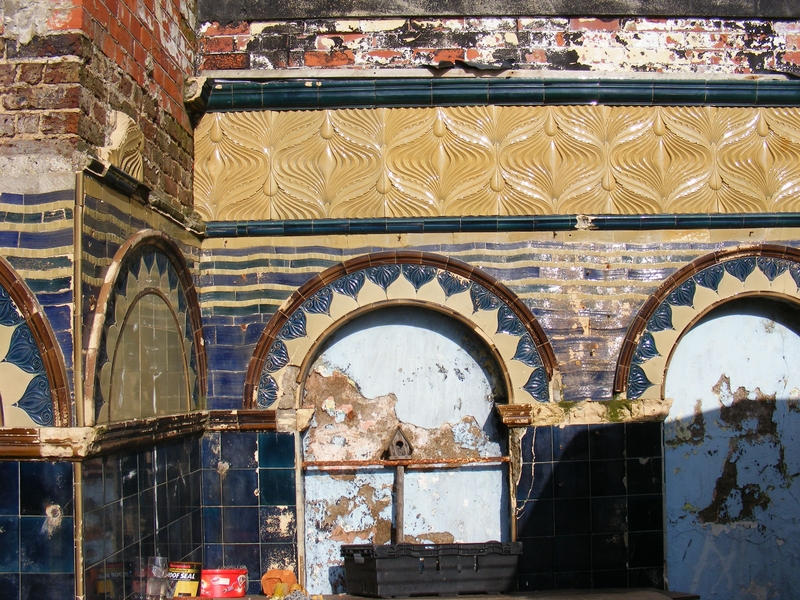 I was introduced to Medina House’s tiles by local ceramicist Amy Smith who studied the history of the building while completing her Masters Degree in Historic Environment Conservation. 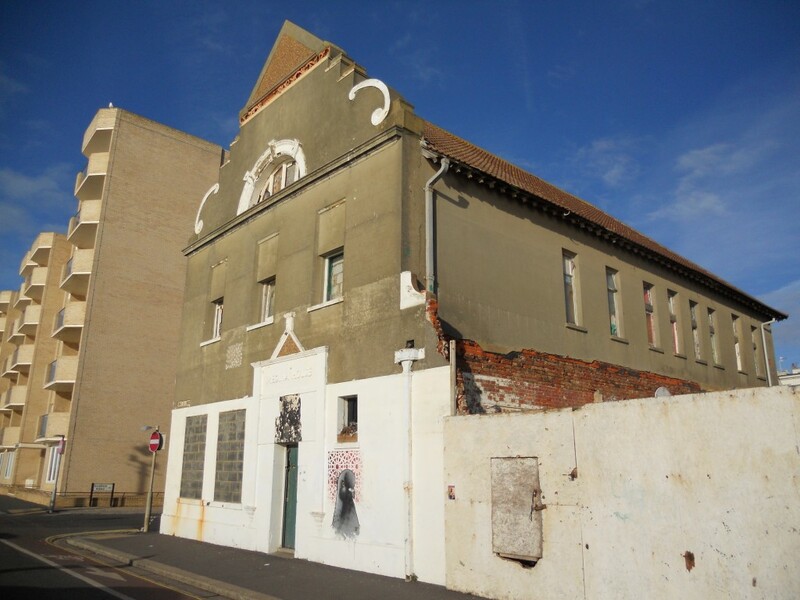 Her report, Medina House and Former Turkish Baths Conservation Management Plan, describes the exposed faience (which consists of glazed ceramic tiles and terracotta) as being of “special interest” and making an “important contribution to the wider significance of the site”. The delightful cream, blue and brown tiles really have to be seen in the flesh. Many other features remain including stained glass, wooden paneling and a wide staircase. In recent times, the King Alfred of course came very close to being demolished to make way for two huge towers. It still looks likely to be the case that Medina House will outlive the building that replaced it. If only a suitable use could be found.